Turn the streets of Los Santos into a stylish electronic videogame battle to the death with the latest update to GTA Online. Achieve hyper speed on the futuristic Nagasaki Shotaro and demolish foes with the power of your light trail in the new Adversary Mode, Deadline. GTA Online: Import/Export now available! Savvy CEOs know there's always more for the taking. While Special Cargo business in Southern San Andreas is booming, another opportunity to expand your hold on the city awaits. With GTA Online: Import/Export it's time to muscle into the lucrative and specialized field of high-volume exotic car theft. Stealing and dealing high-end vehicles is serious business. Building on the supply chains of Further Adventures in Finance and Felony, Import/Export introduces a whole new series of criminal pursuits as CEOs and their organizations boost, modify and resell the most wanted vehicles in the city for big profits. It will take talent, coordination and the tactical use of some brand new Special Vehicles to get the job done, all while staying one step ahead of the police and rival challengers from across the city and countryside. New Vehicle Warehouses will house the results of your importing and exporting operations, while CEOs can also reap the fruits of their labor with expansions to the Executive Office buildings. Add massive Executive Office Garages with up to three floors of showroom quality storage for as many as 60 vehicles, complete with customizable décor and a Custom Auto Shop. Stay tuned for more details about Import/Export, including a glimpse at all new Special Vehicles that deliver a unique breed of vehicular mayhem and destruction to GTA Online. GTA Online: Bikers now available! Life in an MC is more than just a fleet of shiny new rides and impressive leather cuts. Bikers brings a range of new ways for clubs of up to eight players to earn their keep, battling rival MC’s and other criminal factions. Enterprising players can form and be the President of their own MC, while anyone seeking MC life can join as a Prospect. Your MC’s Clubhouse is the base of operations. Choose from 12 available locations across the salty shores of Paleto Bay to the streets of Rancho, and make your purchase via the new Maze Bank Foreclosures website. Each Clubhouse comes complete with its own bar, activities like Darts and Arm Wrestling, various murals and the option to upgrade to your own in-house Custom Bike Shop. The open road isn’t just a stretch of Chumash pavement anymore; log in to the nefarious Open Road online network to launch a new (non San Andreas Board of Commerce sanctioned) business. Choose how your MC is going to earn its money, as Open Road clients offer opportunities in document forgery and cash counterfeiting as well as large scale narcotics distribution. ©2008 - 2015 Rockstar Games, Inc. Rockstar Games, Rockstar North, Grand Theft Auto, the GTA Five, and the Rockstar Games R* marks and logos are trademarks and/or registered trademarks of Take-Two Interactive Software, Inc. in the U.S.A. and/or foreign countries. Dolby and the double-D symbols are trademarks of Dolby Laboratories. Uses Bink Video. Copyright © 1997-2012 by RAD Game Tools, Inc. euphoria motion synthesis technology provided by NaturalMotion. euphoria code is (c) NaturalMotion 2008. ""NaturalMotion"", ""euphoria"" and the NaturalMotion and euphoria logos are trademarks of NaturalMotion. Used under license. This software product includes Autodesk® Scaleform® software, © 2013 Autodesk, Inc. All rights reserved The ratings icon is a trademark of the Entertainment Software Association. All other marks and trademarks are properties of their respective owners. All rights reserved. Software license terms in game and www.rockstargames.com/eula; online account terms at www.rockstargames.com/socialclub. Violation of EULA, Code of Conduct, or other policies may result in restriction or termination of access to game or online account. Player data transfer subject to certain limits and requirements, see www.rockstargames.com/gtaonline/charactertransfer for details. For customer& technical support visit www.rockstargames.com/support. 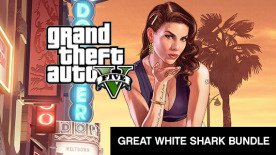 This game will be delivered as a Rockstar Games Social Club redemption code. Customers will require a free Rockstar Games Social Club account to play.